Wheel Profile Wear Evolution tool is intended for prediction of railway wheel profile evolution due to wear. A parallel discrete approach to modeling the wear of wheel profiles is implemented in this tool. The "Parallel" means that different configurations of rail vehicles are modeled in parallel, with the same wheel profiles for all configurations, Figure 1. Configurations differ in track macrogeometry, track irregularities, vehicle mass and so on. The set of configurations should be a representative set of conditions in which the rail vehicle is operated. The "Discrete" means that the track length traveled by the vehicle during the simulation is divided into a sequence of intervals (wear steps). The number of intervals is the same for all configurations. Within each interval the profiles are not changed. At the end of each wear step, a wear depth is scaled according to a mileage assigned to one wear step. The scaling procedure is correct, since a small quantity of material removed due to wear depends almost linearly on the traveled distance (obviously only inside the wear step). After scaling, the wear depth is summarized for the respective wheels by taking into account the weight (statistical) factors of the configurations and the wear symmetry, if any. 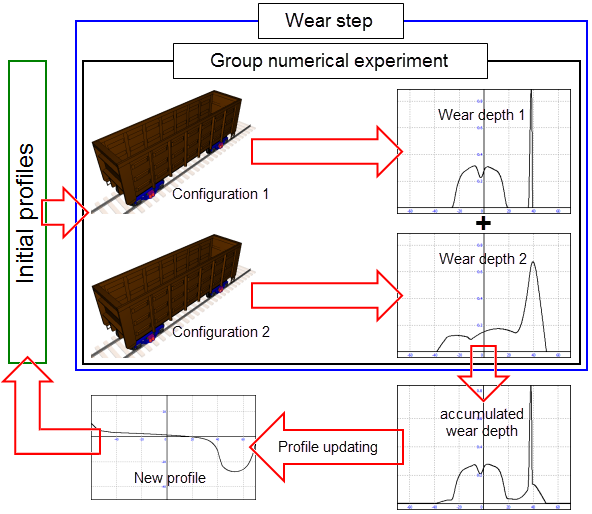 Then the profiles are updated according to accumulated wear depth, Figure 1. The calculation of material losses is based on the theory proposed by J.F. Archard. According to this theory, the volume of removed material is proportional to the work of frictional forces in contact. Contact forces are computed using the model by W. Kik and J. Piotrowski or CONTACT library (www.kalkersoftware.org). In the model of W. Kik and J. Piotrowski, the FASTSIM algorithm modified for non-elliptical contact patches is used to compute the creep forces. Parallel calculation of configurations on multithreading CPUs is implemented to speed up the modeling process. creating source data sets for the simulation of accumulation of rolling contact fatigue damages in railway wheels in UM Rolling Contact Fatigue module. and after a mileage of 200 thou. km. Figure 3. Tread and flange wear of left wheels of the 1st and the 2nd wheelsets of a freight car with GOST 10791-2011 profiles. The user manual and presentation for this tool are available on the download page.